The panic on the left concerning Tuesday's special senatorial election is getting palpable, for on Friday, MSNBC's Ed Schultz said on his radio program that he would try to vote ten times if he lived in Massachusetts. "Yeah, that's right, I'd cheat to keep these bastards out," he told his audience. 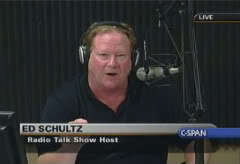 ED SCHULTZ, HOST: I tell you what, if I lived in Massachusetts, I'd try to vote ten times. I don't know if they'd let me or not, but I'd try to. Yeah, that's right, I'd cheat to keep these bastards out. I would. 'Cause that's exactly what they are. Interesting that this occurred the same day MSNBC's Chris Matthews said he was concerned there weren't any left-leaning votes for Democrats to buy in Massachusetts Tuesday. The good folks at General Electric and NBC must be thrilled to know that two of their on-air personalities are so biased in their political views that they publicly advocate cheating for their Party to be victorious. Who says there's liberal bias in the media?